Did Drew Peterson Kill Kathleen and Stacy? Alleged wife killers. Are they innocent? Drew Peterson’s third wife, Kathleen Savio drowned in a bathtub. Peterson’s fourth wife , Stacy Peterson disappeared. Did he kill them? There was no physical evidence. No direct testimony, because witnesses were dead. Peterson was sentenced to 38 years. Could he be innocent? Clay Starbuck was only suspect after wife Chanin was murdered. But 3 unknown DNA samples were found. Chanin had many lovers. I think Clay Starbuck is innocent. Scott Peterson reported his pregnant wife Stacy missing on Christmas Eve, 2003. Stacy’s torso and fetus were found in April 2003. But Scott Peterson might be innocent. Modesto California police concentrated on him, and did not follow up on other leads. His lawyer never introduced witnesses who saw Laci after she was supposed to be dead. Please enter at least three letters to search. 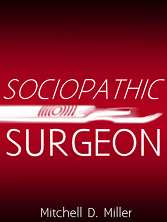 If you like Bad Marriages, you will enjoy Sociopathic Surgeon. Read a free sample on your Kindle or computer.